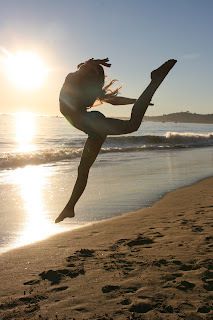 On the last Saturday Snapshot I posted a fun photo of my daughter doing a leap on the beach. I said it made me want to go to the beach on a lovely day and do a "photo shoot" of her doing dance moves in front of the ocean. Well, on Sunday it was 80 degrees here in southern California (yes, it's December) and so I convinced her to go to the beach about 45 minutes before sunset. She spent the whole time saying she was cold, but really I think she was embarrassed. I had a lot of fun taking the photos and when we got home and she saw them she completely changed her attitude and said how it was fun and she's glad we did it. This is why I love digital photography: a few of the photos were a disaster (bad timing mostly); a few were good; and a few were wonderful. Here's a sampling of the ones I really like. As you can see, we played around with the sun and the light angle. Oh sunset is a great time for pics! They look great. Awesome pics! I have to say - I love that your daughter has an amazing body flexibility - really helps with dance moves! That's one issue I had - I was a bit rigid, lol! Yes, that lens sounds FANCY! I have no idea what lens we use on our Nikon DSLR. The biggest thing I've noticed is that we bought a cheapo glare reducing add-on which is super useful in India! Deepali--I think a good lens can make all the difference and I do really like the one I've got since it does far away and close up without having to change lenses. Thank you for reminding me that I have a polaroid anti-glare thing that I should use next time. I always forget about it!